Photo Above: Varda Makovsky (left), Director of Post-Adoption and Family Services, and Heather Mayes Gleason (right), Director of Development, with Angela and Bryan Tucker, the creators of the documentary “Closure." Photo Below: Group of adoption and education professionals gathered to discuss Angela and Bryan Tucker's latest venture. Last night, Barker had the opportunity to spend the evening at an intimate gathering with the inspirational couple behind the movie “Closure,” a documentary about a transracial adoptee who finds her birth mother, and meets the rest of a family who didn't know she existed. The movie makers, Angela and Bryan Tucker, were in Washington, D.C., for a screening of the film at American University and to gather support for their new venture, The Adopted Life Episodes. 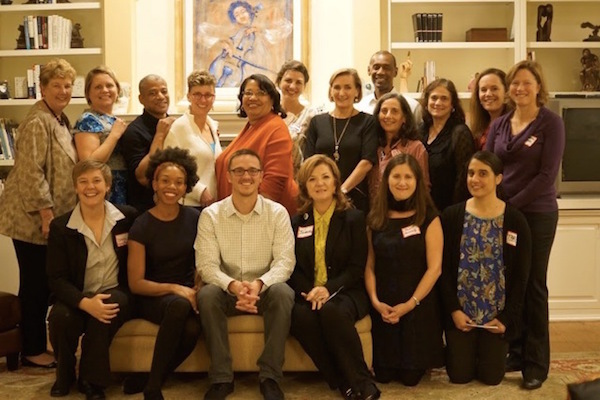 Barker joined adoption professionals from around the DC area, including Adoptions Together, PACT, Children’s Home Society, the Lab School, the Commonwealth Academy, and National Children’s Research Center to meet and support the couple and each other in this important work. Angela and Bryan Tucker’s new venture will again address the complex issue of transracial adoption, but this time from the perspective of adopted kids of color. The idea for the project was born out of their experience at “Closure” screenings around the country. “After watching the movie, children — some as young as ten years old — would come rushing up to Angela, just gather around her trying to get close. The kids just wanted to talk to her, tell their story, connect with an adult adoptee of color,” Bryan told the group assembled last night. As Bryan described the project to the assembled group, there were a lot of heads nodding in agreement about the desire — and need — for transracial adoptees to express themselves, ask their questions, and seek their identify from a very early age. In response to this identified need, The Adopted Life Episodes will include one-on-one conversations between the charismatic Angela Tucker and young adopted children of color to discuss the ups and downs of adopted life. The couple is currently fundraising to create an initial three episodes that will be made available to adoptees and their families, professionals and educators around the country to encourage and stimulate continued conversation around the topic of transracial adoption. The Tucker’s work is an important piece of the expanding conversation around the many complicated facets of adoption, and transracial adoption, in particular: race and identify, tragedy and loss, the meaning of family and love. After the AU screening of Closure, one attendee asked Angela, “My 10-year old, transracially adopted daughter is asking about meeting her birth mother. Is she ready at this age?” To which Angela replied, “If she’s asking, she’s ready."